Early versions did not slow down. Is there any solution other than raising the specification of pc? how its possible if they are the same builds? Also why are you trying 741 ? Ian wrote: Mipmaps are effected by screen resolution. i never knew about that. do i need to change the screen resolution or the emu one? and what resolution should give me a closer match to the arcade? why not? i just wanted to try the new quad rendering. i think that i even found a clipping issue with that version. Out of curiousity, is there a way I mod the Ending music for Harley inside one of the sound ROMs, via Audacity or a hex-editing tool? I wanted to replace it with the last bit of some song I like. I know the rest of the in-game music (except for the attract mode) is all MIDI. Thanks. r754 is fantastic, the shading on the road is something that was missing, now it's perfect. 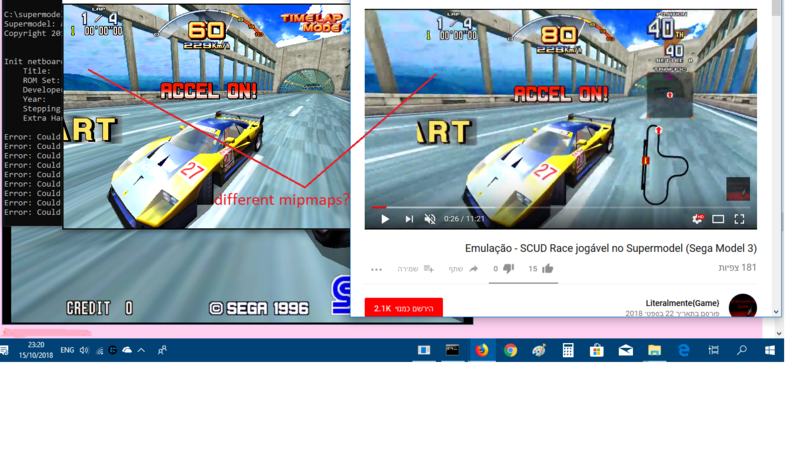 I think some game like "SCUDRACE" is better now in the emulator. Last edited by Abelardator2 on Mon Oct 29, 2018 2:31 pm, edited 2 times in total. r754 is fantastic, the shading in the middle part of the bottom is something that was missing, now it's perfect. You are welcome Was a lot of hard work (not just by me). The renderer I would say is extremely accurate, there is just one feature missing, which is different LOD models ..